The only good food is fresh food. Ok its time to close down and move on.Here is a link to my new blog and a big thank you to those who followed me! I found a new home for a ladybird.She is now happily living amongst my broad beans.Why do this ?Ladybirds are a natural predator of aphids. Although must admit that young ladybirds are not pretty to look at.However they also love their aphids and should not be past over. So the next time you hear voices calling, look down because you just never know what you might find. Every Colour under the Sun. Every year I like to try to grow something that is hard to come by in your local shop.This year I have gone for Painted Mountain Corn.Painted Mountain contains every shade of color known to corn. The 4-5 foot stalks bear up to 2 narrow, 7 inch long cobs.Painted Mountain corn is ideal for growing in areas with a short growing season. 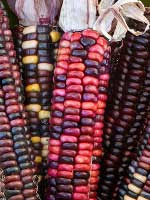 Painted Mountain is a Heirloom variety of corn. This means that the plants are open-pollinated (as opposed to hybrids) and so the the seeds can be saved from the crop and handed down from generation to generation. The seeds I got for these came from Brown Envelope Seeds. Madeline, from Brown Envelope Seeds also keeps a blog. So stay tuned to see how I get on. 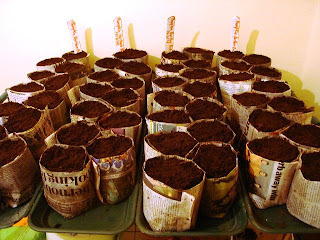 Well here are my pumpkin seeds all covered up in nice moist compost and left in my "germinating room ". 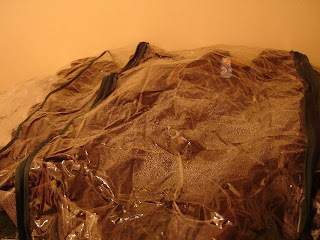 They are then covered with plastic sheeting so as to keep the compost moist and warm.Then its just a case of waiting and checking every day to make sure that the compost does not dry out.These were set on April 13. And then today things started to stir. They had to be moved to thier new home by the patio door so as to get that all important sunlight.They grew quite fast but will have to remain indoors till all danger of frost has past. This year all the pumpkins I am growing are saved seed from pumpkins I grew last year.They are Northern Bush pumpkins which I sourced from Irish Seed Savers. If you have a few minutes to spare here is a little video of the ones I grew last year. Why don't you join in the revolution that is going on at the moment.Click on the picture above to see whats it all about.If you feel that you only have a small patch then you should check out Trevor Sargents blog that he is keeping in relation to his own garden.It seems like a small patch but he sure seems keen in growing on it. 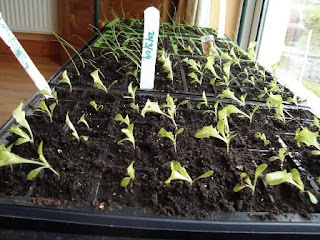 Here are a few plants that I have started indoors.The lettuce and onions just cant wait to get out there.Here are just a few after being turned.They need to be turned every day and ideally should be placed near a south facing window.They just know how to find that light. 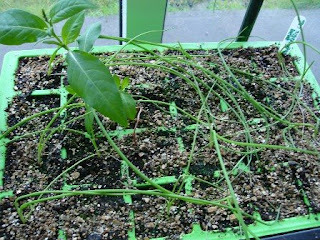 Its a very controlled environment and gives your plants a great head start.It also throws up the odd surprise.Above you can see a rather strange looking plant happily growing amongst the onions.Don't know what it is but will plant it out in its own special patch of ground, just to see what comes of it. 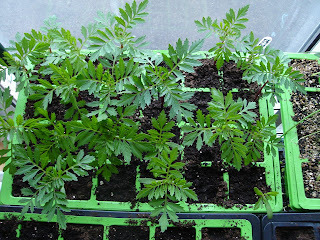 Of course cant forget the flower pots.Here are some marigolds coming along.Here is a good link to help you get started in growing from seed. Well this is the new bit of ground that I will be growing on this year.Looks a bit rough.It had being covered by heavy duty black polythene for a few months.This helps to kill off weeds and it also helps to keep the ground that bit drier.Before putting down the polythene I covered the ground with rotted manure.This helps fertilise the ground and it also increases the worm population. Looks alot better.Was very lucky with the weather and managed to get a dry day. I even managed to get some carrots planted.Started off with early nantes.You will notice bottles thrown around here and there.They are plastic bottles and are half filled with water.The idea is to discourage cats and dogs from digging.The theory is that the light reflecting from the water some how discourages them.Tried it last year and it worked.Doesn't stop them from coming in on the ground, but did not find any freshly dug holes. I also got a few seed beds ready for brassicas. Welcome to my blog.Here I want to share the ups and downs of a hobby that maybe you can learn something from.Feel free to leave me some advice in the comment section so that I can learn from you too.